Salad does not have to be boring. It does not have to be “rabbit food” and it does not have to lack flavor. Salad, like any food, can be mediocre or it can be great. The salad above is a variation of one of my favorite salads. 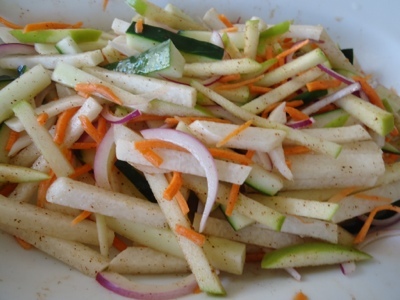 It is a jicama base with cucumbers, red onions and carrots. In my typical version I use mango, but as I had apple, and did not have mango today, I went with the apple. The “dressing” is lime juice (fresh squeezed in this case) and chili powder. Yes, chili powder. It marries extremely well with the jicama. It’s crunchy, a tiny bit sweet and has a little tang from the lime and the mildest hint of heat from the chili powder. I paired this with some BBQ pork I had in the freezer and it ended up being a delightful little lunch. 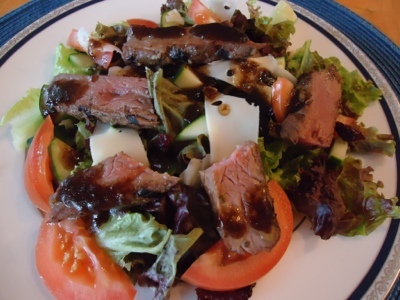 I used the lettuce, tomato, and cucumber from the weekly basket, added some of the Farmhouse goat cheese from Scotland (yes, we are still working on those) and leftover hanger steak. I topped it with a mix of grated garlic, black current balsamic vinegar and olive oil. This one came out really good and my only complaint was the tomato – no matter how fresh, tomatoes in Florida are just not Jersey tomatoes and I really, really miss those.